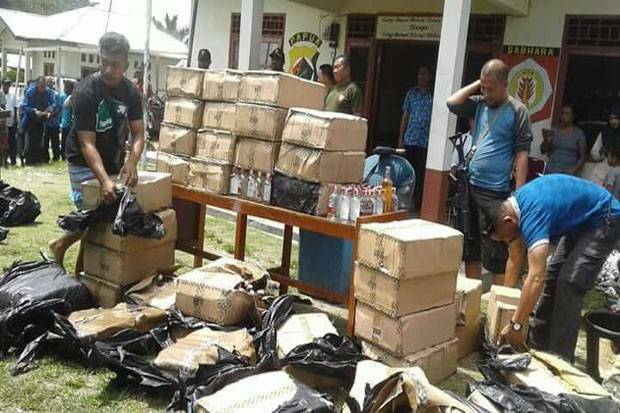 Reported from sindo.news - the teachings of Elelim District Police, Jayawijaya Regional Police, Papua Regional Police, succeeded in thwarting the smuggling of 2,593 illegal bottles of vodka which were smuggled into Elelim, the capital of Yalimo Regency, Papua, Thursday (08/02/2018) around 09.00 WIT from Jayapura by land (line Trans Papua). From the information gathered, this arrest was carried out by Elelim District Police on Thursday, August 2, 2018 at around 9:00 a.m. in Yalimo District. At that time the perpetrator's car named Jenny Tenando (driver) was about to pass on Jalan Trans Papua, Elelim. However, at the same time Police Elelim conducted a raid vehicle from Jayapura. 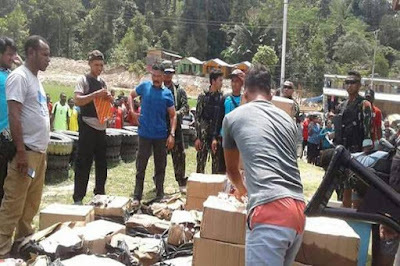 Because they did not want to be hit by raids, the perpetrators threw away 54 alcoholic cartons of Vodka (2,593 bottles) in the Abenaho District precisely at km 141. Elelim police chief Brig. Gen. Hanock Wambrauw together with 3 members and 4 members of Brimob had a chase. They also found 54 cartons. Furthermore, alcohol is secured to Mapolsek Elelim for further legal process. The perpetrators secured were Jefriadi Syam, (28) Members of Unit 775 / Merauke, Melkhi Palulun (29), Member 751 / Sentani, and Jenny Tenando, (43), Private (driver), Elelim-Yalimo address. All of the evidences in the form of 2,593 bottles were packed in 54 Vodka types of alcohol, 1 (one) red Ranger type Ranger with 7597 DS TNKB. Meanwhile, Jayawijaya Police Chief AKBP Yan Piet Reba confirmed the arrest of thousands of alcoholic bottles by Elelim District Police. According to the Chief of Police, the arrest was due to information from the community where previously informed that there was a group of Strada cars from Jayapura to Wamena, who were allegedly carrying illegal alcohol. "So on August 1, 2018 yesterday we got information from our friends in Kerom, precisely in Senggi well, give information that there are 9 Extrada cars from Jayapura to Wamena, which transport liquor. After receiving the information, I finally ordered the Elelim police chief, Brig. Hanock Wambrauw, to conduct a vehicle raid on the cars in Kobakma, 10 km from Elelim, "he said, Friday (08/03/2018). From the Razia, 70 cartons were secured as many as 16 cartons were thrown into the abyss by the perpetrators, and the entire carton was broken. So the total secured by our members in the field is 2,593 bottles, Vodka alcohol, "AKBP Yan Piet Reba said. Related to the perpetrators, until now it is still being examined. Whereas information related to two members of the TNI involved in the Police Chief surrendered completely to the local Dandim and Sub Den Pom Wamena. "For the perpetrators of the total alcohol smuggling all six of them are all civilians. "For the two perpetrators who are members of the TNI, as far as I know, they only safeguard the Trans Papua route, if the matter of their involvement so far will be the Dandim and Sub Den Pom affairs," he said.